The Oracle Certified Associate exam (required for all Oracle Certification) can be difficult to pass, even for experienced Java developers. I have seen many Java developers having 2 to 4 years of experience in Java going into an exam without preparation and coming back either with a very low score or worst, just failed the exam. One reason for that is the knowledge level of the exam is quite deep. 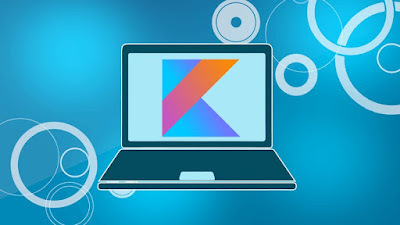 It focuses on details which many Java developers don't know even if they have worked in Java for years. That's why preparation is very important. Someone has rightly said, "Failing to Prepare means Preparing to fail". 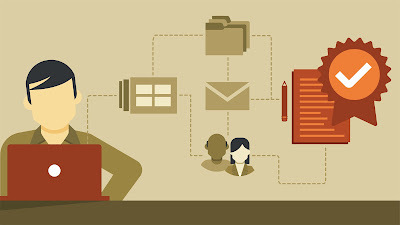 So you should spend some time to understand the best way to prepare for Java certifications. The right preparation not only helps you to pass the exam but also score over 90% which gives you an extra edge over other candidates during any job search or promotion discussion. 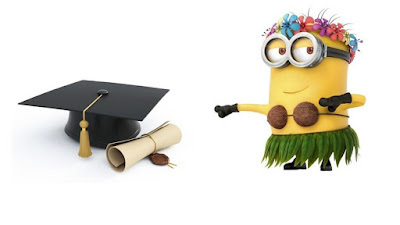 Without further ado, here is my list of some of the best online Java certification courses you can take to kick-start your preparation. Since both OCAJP and OCPJP requires a deep understanding of exam topics, it's a good idea to start with a training course and then follow-up with a certification guide like Mala Gupta's OCAJP 8 Guide. This way you will not only learn better but also remember better, as exam certification guide presents questions in the same format of the real exam. This is the best course to learn Java in general but it also helps you to prepare for OCAJP 8 topics. I recommend this online course to anyone who is learning Java and want to pass a 1Z0-808 certification exam. After completing this course you have a decent knowledge of Java and you can fill the gaps between your knowledge and exam topics by reading a good OCAJP certification guide like this one. 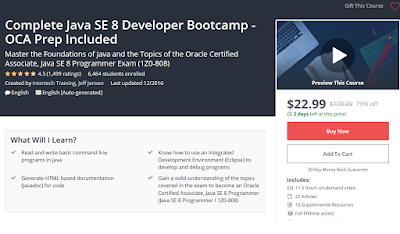 This course teaches you Java SE 8 in the bootcamp style where the focus is given to hands-on knowledge. 3. 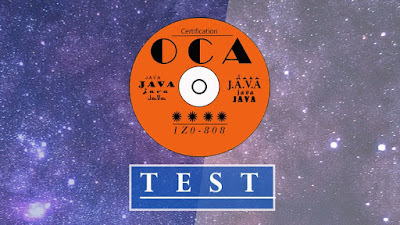 Oracle Java Certification - Pass the Associate 1Z0-808 Exam! This is another great online course for Java developers preparing for OCAJP 8 exam. It will teach you everything you need to know become an Oracle Certified Associate Java 8 Programmer. The instructor, Goran Lochert is a certified Java developer and an expert, with many years of programming experience in Java. Goran knows first hand what is required to pass the exam because he has done it himself. He will take you to step by step, going through each and every topic you need to master, to be able to pass the exam and receive your official Oracle certification. If you’re a beginner looking to learn Java or an experienced programmer looking for an online training course to prepare for Oracle's Java certification e.g. OCAJP 8 or 1Z0-808 exam then this is the right course for you. This course also covers all exam topics and after this course, students will be able to pass the Oracle Certified Associate, Java SE 8 Programmer (1Z0-808) exam. These are hand-picked questions, that mimic the actual certification exam and are time-bound, which will help you get prepared for the main exam environment. That's all about some of the best online courses to prepare for Oracle's Java Associate and Professional Certifications. If you have registered for 1Z0-808 or 1Z0-809 exam then you can take these courses to start your certification journey. If you are looking for more useful resources e.g. books and exam simulators then you can check out my following articles. Thanks for reading this article. If you find these Java certification online training courses useful then please share with your friends and colleagues. If you have any question or doubt then please drop a note. P.S. - Whizlabs now also has a training course on OCAJP8, if you are a fan of Whizlabs exam simulator then you should also you that in conjunction with their exam simulator to get the best result.